Thanksgiving is practically here! I love gathering for a big meal together. At our house, everyone sits together at the same big table. So we have a combined adult and kids table. This works for us right now and I love being able to share a meal with our family all at one table. 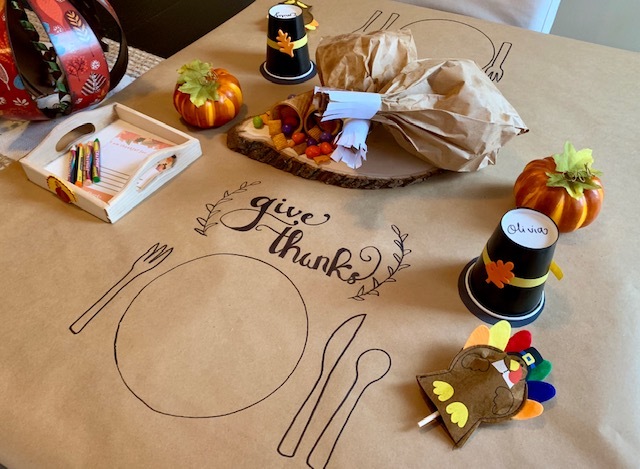 I have some great tips & tricks on incorporating the kids into the adult table. These are tried and true tips that are sure to keep the kids happy and entertained during your meal and after! Watch my Good Morning Washington Segment on Kids Thanksgiving Table Here! 1. 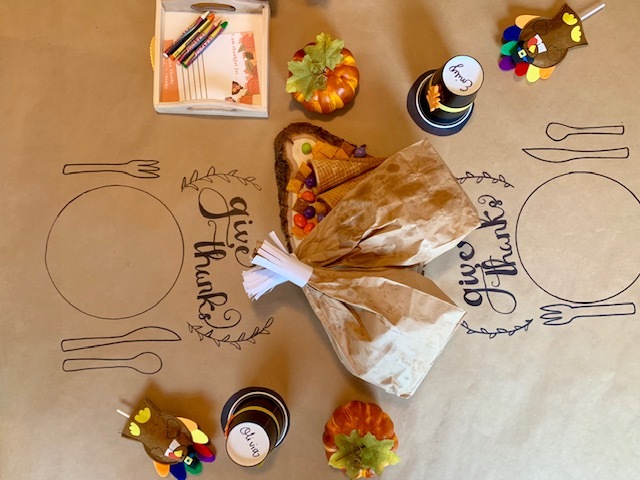 Themed place Setting- This is a fun DIY way to set the table with some kid friendly decor and DIY touches. My oldest daughter who is 14, had a good time making these placemats. These are simply made with a sharpie and thick brown paper. You can cut these into individual mats or place over the entire table. Both ways look pretty! We traced plates and silverware and added some decorate leaves and a saying. We also made pilgrim hats with cups and paper for name tags. Easy, beautiful, festive! 2. 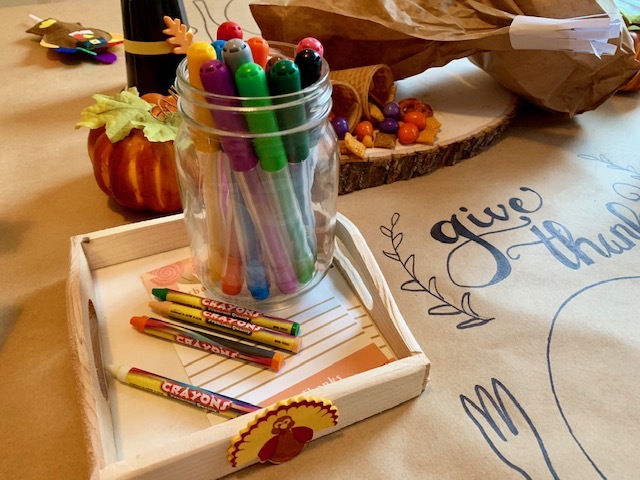 Coloring Station Centerpieces- These are so handy. This really helps keep the kids occupied and entertained. I buy these little trays and jars, and fill them up with coloring pages, and even let them decorate the tray. Set it in the middle of the table and let kids go to town. 4. Cornucopia Snack- Kids need snacks. 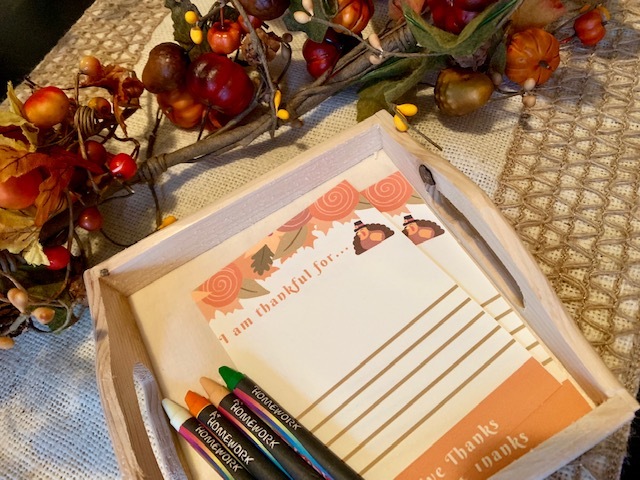 I have these set on the table and ready for them to enjoy while they wait for Turkey. This is as simple as filling a waffle cone or sugar cone with snack mix, candy corn, m+m’s, or whatever you’d like your snack mix to be! 5. Turkey Popcorn Bags- Another themed snack for kids to enjoy before or after they have finished eating. 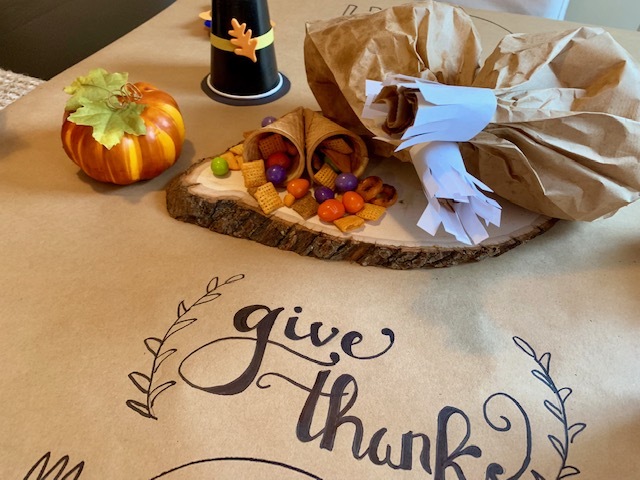 With brown paper bags, white paper and popcorn, you have an adorable and edible turkey leg snack! Fill the bag 3/4 with popcorn and top with the white paper that is slit 3/4 down. So easy, so fun! The kids love these! Enjoy your Thanksgiving! I am so thankful for all of you magnificent readers!